It is known that in the space surrounding the Earth (the space up to the geostationary orbit altitude, called Geospace), there are natural trapped charged particles, Van Allen belts, that may affect commercial satellite services (meteorology, communication, GPS and others), and there is concern that astronauts would be exposed to these charged particles, for example in a manned mission to the moon. The high-energy electrons in the Earth’s Van Allen belts are known to be generated by resonant interactions of electromagnetic chorus waves*1) evolving in the magnetosphere with energetic electrons; this phenomenon is called a chorus wave-particle interaction*2). It is known that the chorus wave-particle interactions accelerate electrons to relativistic energies and also precipitate energetic electrons from the magnetosphere into the Earth’s atmosphere along geomagnetic field lines to cause special types of auroras. In addition, it is suggested that energetic electrons precipitating into the Earth’s atmosphere along geomagnetic field lines not only generate auroras but change atmospheric composition. Thus, investigation of the magnetosphere, where the chorus wave-particle interactions are generated, should give clues to the electromagnetic environment in the magnetosphere and of its effects on the Earth’s atmosphere. This field has received international attention for more than 50 years. However, since a single packet of chorus waves lasts for less than a second, and since it is almost impossible to investigate the vast magnetosphere using a limited number of scientific satellites, the spatial development, especially, of the magnetosphere has been poorly understood. The present international research team consists of researchers from Kanazawa University, Nagoya University, The University of Electro-Communications, National Institute of Polar Research, Kyoto University, Tohoku University, Institute of Space and Astronautical Science of JAXA, University of Florida (USA), National Institute of Information and Communications Technology, Athabasca University (Canada) and 3 other institutions. Using the scientific satellite Arase (launched in 2016, which investigates dynamics of Van Allen belts as well as geospace storms), the team was successful for the first time in simultaneously capturing not only chorus wave packets in the magnetosphere but also transient auroral flashes (several hundred milliseconds) about 30 thousand kilometers distant from Arase, generated by chorus wave-particle interactions. 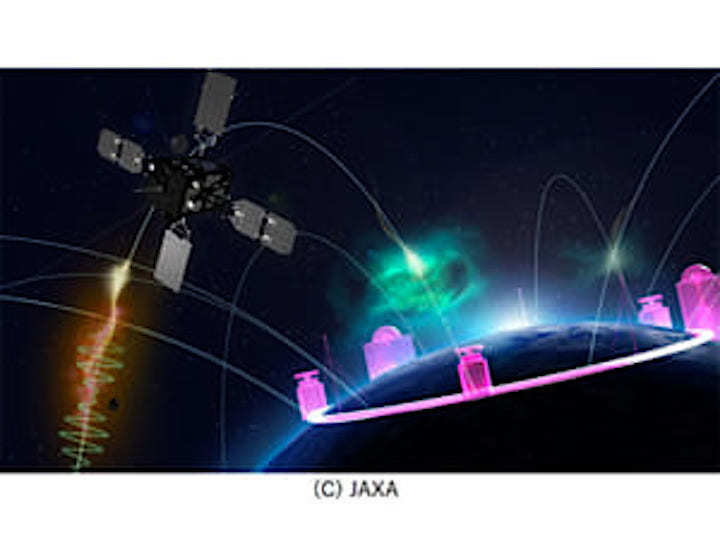 In order to simultaneously capture aurorae and chorus wave-particle interactions, which are related to each other, a scientific satellite is required in an appropriate orbit as well as an observation network on the ground that realizes conjugate observations with the satellite. 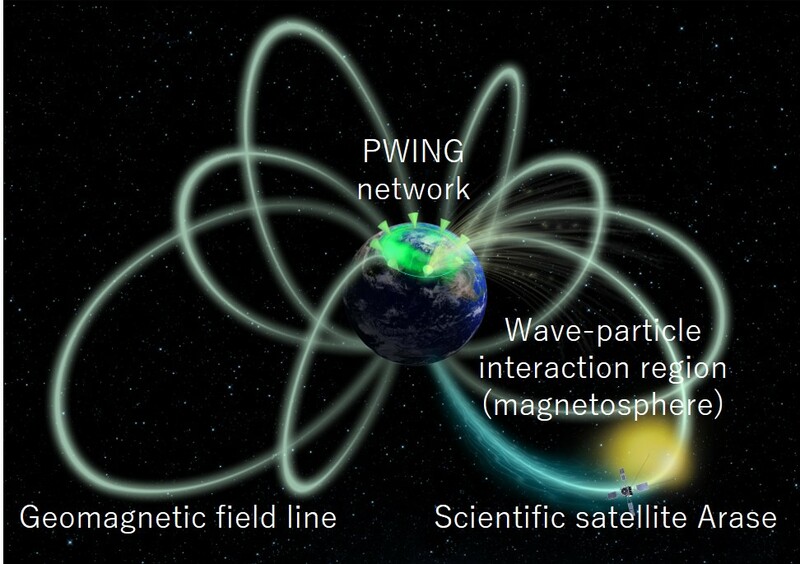 The research team developed a world-leading electromagnetic wave measurement system which was aboard the Arase satellite, and established PWING (study of dynamical variation of Particles and Waves in the INner magnetosphere using Ground-based network observations) covering the entire Earth (but mainly in the northern hemisphere) longitudinally along almost the same geomagnetic latitude*3). The research members actively traveled to each PWING international ground base to install new high-sensitivity cameras and other instruments (see “Observation News” in PWING web page). Thus it became possible to capture details of chorus waves by the Arase satellite as well as to capture related aurorae from any longitude and at any time (Figure 1). This enabled simultaneous observations with high time resolution (10 milliseconds). A flash aurora observed at Gakona, Alaska, USA, one of the PWING international bases, which is connected with the Arase satellite along the geomagnetic field line, showed spatial and intensity variations of the order of hundreds of milliseconds, which corresponded with those of chorus waves in the magnetosphere (Figure 2). This observation revealed that a flash aurora could become a display showing spatial developments of wave-particle interaction regions accompanying chorus waves. Intensity and spatial changes of aurorae captured on the ground have visualized details of wave-particle interaction regions, which could not be captured by point observations using a scientific satellite. The observation has confirmed the geomagnetic north-south asymmetry for the first time. The observed variations indicate not only spatial evolutions along geomagnetic field lines by effective resonance of electromagnetic waves and electrons (observable as time-dependent changes of auroral intensity) but also evolutions across geomagnetic field lines (observable as spatial changes of auroral morphology). The observation also suggests rapid precipitation, in hundreds of milliseconds, of energetic electrons into the atmosphere, which may bring about changes of the atmospheric composition. The present study has revealed previously unknown spatial developments of wave-particle interaction regions across geomagnetic field lines. It presents analyses using a scientific satellite and a ground observation network. In future, more characteristics of a general nature should be revealed by analyzing a large number of flash auroras. However, there might be difficulties in analyzing the very big data sets by conventional visual observation, since it is now found that such special aurorae showing details of spatial developments of wave-particle interaction regions have a duration of only hundreds of milliseconds. Nonetheless, the present international research team could resolve this problem using artificial intelligence (AI). With AI technology, it should be possible to make hazard maps of the electromagnetic environment of the magnetosphere, which should contribute to safe and secure space exploration. It is also known that chorus wave-particle interactions take place on other magnetized planets. The scientific mission Mio (launched in 2018) for the magnetic field of Mercury that is equipped with a copy of the electromagnetic wave measurement system developed by the present team is expected to reveal their characteristics. Figure 1. Schematic illustration of coordinated observation using the scientific satellite Arase and PWING, a ground-based observation network. Through detailed observation by the scientific satellite Arase in the magnetosphere and observation of aurorae along geomagnetic field lines from the ground, it is possible to investigate and capture the spatial distribution of generation regions of wave-particle interactions. One-to-one correspondence of packets of chorus waves with a duration of hundreds of millisecond observed by the scientific satellite Arase and a flash aurora observed at Gakona, Alaska, USA. Figure 3. North-south asymmetric spatial change of flash aurora. An intensity change of 1 pixel indicates temporal change along a geomagnetic field line, and morphology change indicates spatial change across the geomagnetic field line. The electromagnetic waves accompanying cyclotron movements of electrons along magnetic field lines. Especially those which can be converted to sounds that resemble a birds’ chorus are called electromagnetic chorus wave (the link includes sound files of chorus waves observed by the Arase satellite). Interaction of electromagnetic waves and electrons in collisionless plasmas. Through the interactions, energetic electrons are accelerated to a higher energy state and scattered. Geomagnetic latitude is a parameter analogous to geographic latitude, defined by the axis of the geomagnetic dipole. The geographic North Pole and South Pole are not identical to the geomagnetic North Pole and South Pole. When referring to phenomena concerning geomagnetism, the geomagnetic reference field is used.